Rediscover the history of the Monaco as the celebrated watch marks its 50th anniversary this year. Though rivals, the three companies got together in the 1960s and pooled their resources to develop an automatic chronograph movement. Automatic watches had taken off in a big way and the race to create the first automatic chronograph was intense. Back then, Heuer didn’t have “TAG” in its name yet, and Hamilton only came into the picture in 1966 when it acquired Buren that was already in the partnership. Known as Project 99, the collaboration also included movement specialist Dubois-Depraz. All three partners debuted their respective watches endowed with this revolutionary accomplishment in 1969. In the case of Heuer, it appeared in the Autavia, Carrera and, most importantly, an entirely new model called Monaco. The original Monaco watch, the Monaco 1133, immediately stood out for its large square case paired with a blue metallic dial. A distinctive quirk of Calibre 11 was that the crown appeared on the left side of the watch although the chronograph pushers remained on the right side. Before the Monaco, square watches were strictly dress watches. Designed by casemaker Piquerez, the Monaco has the distinction of being the first square watch to have water-resistance capability. Although not designed for motor racing, Monaco somehow became associated with the high adrenaline sport. 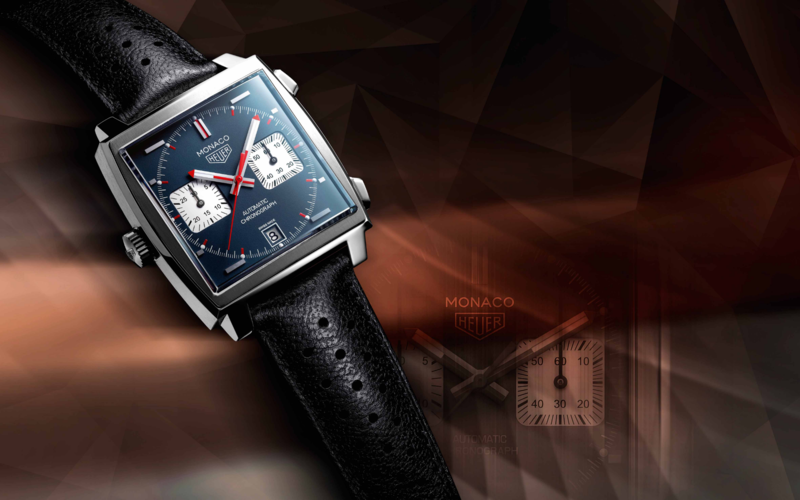 For one, it was named after the Monaco Grand Prix, of which TAG Heuer became its official partner in 2011. Then there is the Steve McQueen connection. Monaco’s fame on the racetrack, oddly enough, became forever sealed when it appeared on the wrist of the screen icon in Le Mans, a movie about the legendary 24 Hours Le Mans race, in 1971. Formula One racer Jo Siffert, a Heuer watch devotee who also happened to be the company’s first ever brand ambassador, was employed as a stunt driver on the film. Upon seeing Siffert’s white jumpsuit with the Heuer logo, McQueen insisted on wearing the same outfit in the movie. CEO Jack Heuer then got a call to send some watch options over. The race-compatible Autavia was one of them but as it happened, only the Monaco had three copies needed for filming: one for McQueen to wear, one for photography, and another as a back up. Today, it is hard to think of the Monaco without the image of McQueen in his white racing suit coming to mind. Adding to the groundbreaking heritage of the Monaco was the Monaco V4 that marked the company’s debut foray into extremely high-end mechanical watchmaking. First presented as a prototype in 2004, it was commercially realised as a limited edition in 2009. Developed entirely in-house, the automatic movement featured the patented micro-belt transmission (not unlike a car engine) and a linear weight. A tourbillon, the crème de la crème of watch complications, was added in 2014, making it TAG Heuer’s most haute timepiece.